This supplement is perfect addition to fans of the spy genre and stealth action games. 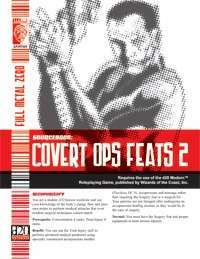 The Covert Ops Feats supplement has nearly 100 feats that are perfect to be used in espionage based d20 Modern game. This 19 page PDF is just the sort of thing needed for GMs to add depth to any great d20 Modern campaign world and gaming session. Written by Chris Field & Louis Porter Jr. This title was added to our catalog on November 09, 2006.